Disclosure: I received the game and dump truck for feature from Educational Insights. All opinions are my own. Can you believe that it's almost Easter? My kids are excited about going egg hunting and basket making is underway. Since they have a sweet tooth like me and indulge in candy/chocolate on an almost daily basis, it seems better to limit sweets in the basket and fill it with fun games and toys instead. 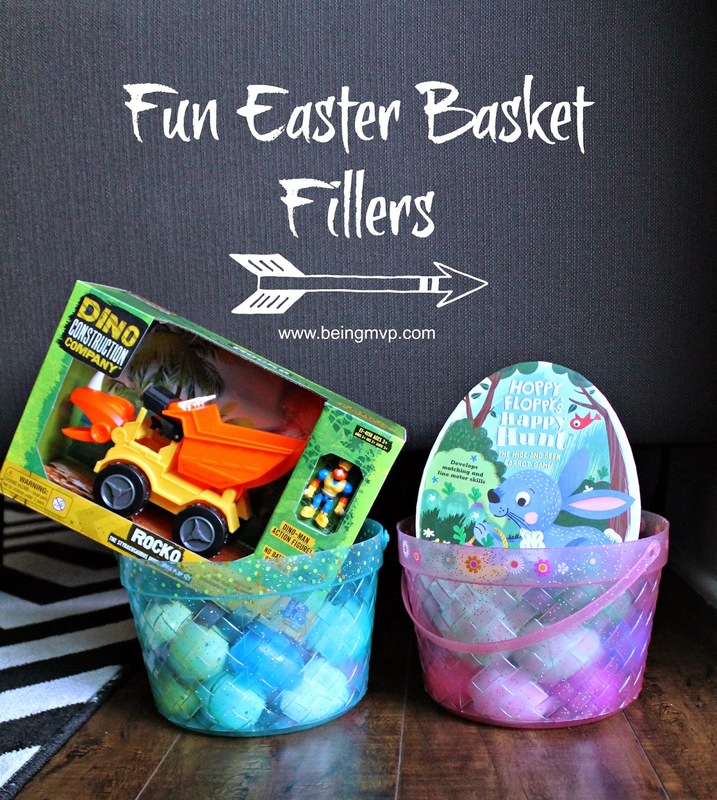 Educational Insights has some fun new toys and games that are perfect to fill your baskets this Easter. Hoppy Floppy needs your help hunting for colorful carrots! Fill your basket first, and you win in this sweet, springtime, hide-and-seek game. Watch out: Spin “steal a carrot,” or “knock over your basket” and things get a little more hare-raising. Simple to play and understand for young ones, and easy to set up and clean up! 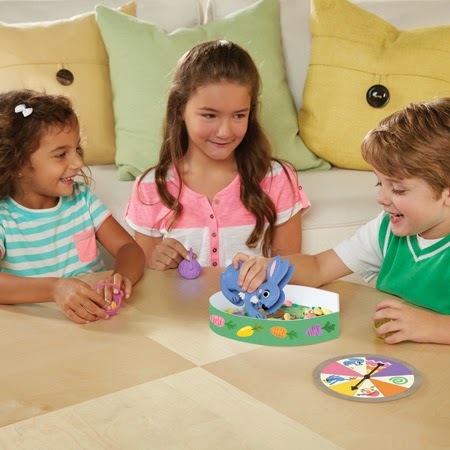 This game develops fine motor skills, hand-eye coordination, and pre-handwriting skills. It also improves matching and strategic thinking skills while reinforcing color learning, encouraging social skills and turn-taking. This game is based on Educational Insights’ award-winning Sneaky, Snacky Squirrel game. It includes colorful carrot-shaped board, 1 Hoppy Floppy Squeezer, 16 carrots, 4 baskets, game spinner, and guide. For 2-4 players ages 3 and up. Helix, Rocko, and Snap can build and bash anything, anywhere— no project is too big for this ultra-tough trio that’s part construction vehicle and part dinosaur! All are kid-powered (no batteries required), and perfect for dirt, sand and even snow, leaving Dino tracks along the way! Each one comes with a poseable Dino man action figure. Dino Construction Company™ Helix the Stegosaurus Cement Mixer Play Set is Stegosaurus, part cement mixer, this behemoth brute features a spinning mixer, movable jaws, and dino track tires. Ages 3+. 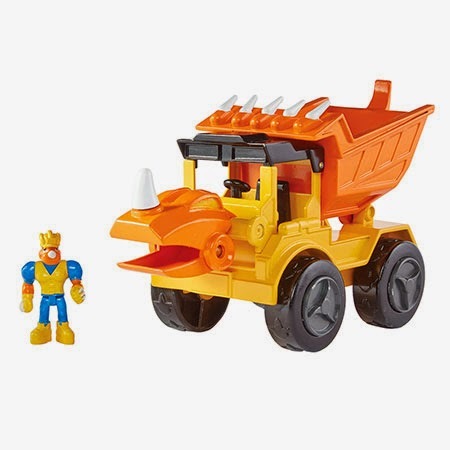 Dino Construction Company™ Rocko the Styracosaurus Dump Truck Play Set is Part Styracosaurus, part dump truck, this spiked superstar has a hinged dump bin, movable jaws, and dino track tires. Ages 3+. Dino Construction Company™ Snap the Velociraptor Forklift Play Set is part Velociraptor, part forklift, this lifting lizard features a sliding lift, movable jaws, and dino track tires. Ages 3+. What are you filling your Easter baskets with this year? One Winner will Receive the Hoppy Floppy’s Happy Hunt™ Game and a Dino Play Set! I would put the Playfoam® Sparkle 4-Pack in my grandson's Easter basket, too! I would love Hot Dots® Jr. Pete the Cat® I Love Kindergarten! Set + Pen for my daughter. I like the The Sneaky, Snacky Squirrel Game. I would like to put the GeoSafari Jr. Bright Eyes Magnifier in my granddaughter's Easter Basket. I would like to put their Playfoam Classic 4-Pack in my little grandson's Easter basket! I've heard great things about the Sneaky, Snacky Squirrel game. I think my 3yr old would really enjoy it! My granddaughter would love to find the Hot Dots® Jr. Princess Fairy Tales Interactive Storybook Set in her Easter basket. I would love Nancy B's Science Club™ Stir-It-Up Chemistry Lab & Kitchen Experiments Journal this looks like it would be a lot of fun to do with my daughter! My son would love the dinosaur puppet on a stick! I'd like to put the Playfoam Sparkle 4-Pack in dd's basket! I love the Hot Dots. Love their "Egghead" Easter basket too! I would also love the Playfoam combo 8 pack for my little guy! I like the magic moves wand for my daughter. I'd like to get the HotDots for REading for Kindergarten age! My son would love Dino Construction Company™–Wrecker the T-Rex Skid Loader. He loves to dig! I think the game Nowhere to go would be a great addition to an Easter basket. GeoSafari® Jr. Kidnoculars™. This would be a perfect addition to the basket! i would put the Magic Moves® RainbowJam in my youngest sons easter basket. The Hot Dots Jr. Princess Fairy Tales Interactive Storybook Set. My would love the Educational Insights Dino Construction Company- Boom -The Brachiosaurus Backhoe as well. I love that they put dino's and tractors together, awesome combination! We like Hot Dots® Jr. Card Set Numbers & Counting. I would put the GeoSafari Jr. Bright Eyes Magnifier in my little girls basket! I would get the Hot Dots Jr. Card Set Beginning Phonics for my nephew. I would like the Koala Capers™ Game. I would love the USA Foam Map Puzzle for my grand daughter. Id love the sneaky snacky squerril game and the underwater safari boat for my kids! My daughter loves Pete the Cat. I'd get her the Hot Dots® Jr. Pete the Cat® I Love Kindergarten! Set + Pen. USA Foam Map Puzzle. He would enjoy it and learn about our world.